Foodies recoil at the thought of detox diets. It’s usually wheatgrass shots, liquid cleanses and other sorts of unfulfilling rabbit food. Thankfully, Sawasdelight does detox with a difference, offering delicious Thai-style spa cuisine that’s good for what ails you. Taking over the Mist Ramen space, Sawasdelight’s owners have swapped out the former noodle shop’s monochromatic reds and silvers for bright and happy greens and yellows. And, in place of an open ramen counter, you’ll find the restaurant’s chefs busy at work behind a giant glass-fronted kitchen window. But our favourite thing about this new space is how it’s perfumed with the scent of fresh coconuts. Relax, take a deep breath and enjoy your meal. Having just opened a few weeks ago, Sawasdelight’s menu is still small, listing only a dozen or so dishes with a few more in the works. Yes, they do serve wheatgrass, but there’s also much more in the beverage department, including cleansing smoothies, freshly brewed teas and a couple of mocktails and alcoholic creations. Whether you’re shooting for a liquid or solid diet, nutritional values are listed alongside each item so diners can keep track of what they’re putting into their bodies. Clocking in at 122 calories, the homemade flower dumplings ($68/four) are stunning, bite-sized florets that wouldn’t look out of place in a kaiseki set. All-natural butterfly pea flowers give the chewy wrappers a brilliant, purple hue and each piece hides a candy-like mash-up of minced chicken and crushed almonds. It’s a complex balance of sweet and savoury, further tempered by a splash of fragrant coconut milk. It’s much more impressive than, say, the assorted satay platter ($78), which relies too much on the accompanying almond sauce for flavour. The chicken tom yum soup ($68) here is also much lighter than what you’ll score in Kowloon City. It’s not necessarily a bad thing since the clear consommé still boasts a clean, crisp heat, despite its short finish. 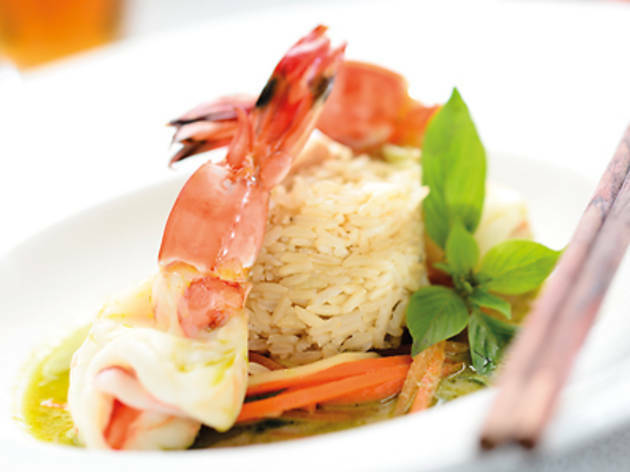 Mains follow the same light-eating philosophy and the 255kcal green curry with baked king prawns ($158) is a surefire winner. You get two succulent shell-off pieces arranged on a bed of zucchini and carrot ‘spaghetti’ with brown rice added to bulk up the meal. These ingredients soak up ample amounts of curry sauce, which, in turn, is spicy and herby without overpowering its surrounding flavours. 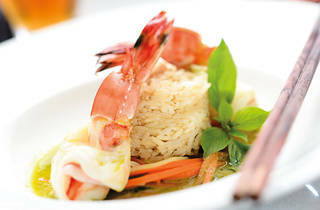 The chefs also whip up a tasty salmon with pomelo salad ($148) but trust us – it’s the prawns that you want. Given the low-cal value of Sawasdelight’s apps and mains, it’s okay to indulge a little at the end of your meal. Desserts are surprisingly complex, like the coconut sorbet served with sliced jackfruit and beet-coloured tapioca pearls wrapped around diced water chestnuts. We’re not entirely impressed with the sorbet’s large and crunchy ice crystals at first but the overall dessert is still a delicious mouthful with a refreshing layering of flavours and textures. Sawasdelight 4 Sun Wui Rd, Causeway Bay, 2808 2728. Mon-Sat noon-3pm & 6pm-11pm.